Download "DiDDeM: A System for Early Detection of TCP SYN Flood Attacks"
4 into the behaviour and effectiveness of a PF within the network environment. Second, once an attack is detected, packets to be dropped are searched for elements of interest to confirm the attack. A. Stateful Signatures Congestion occurs within networks. Thus, routers employ congestion algorithms, such as RED  or ChOKE , to ensure that they do not fail when faced with high levels of traffic. These algorithms may be as simple as employing a first in, first out (FIFO) queue. Once the queue maximum limit is reached, packets are dropped in accordance with the congestion algorithm to ensure queue space for further incoming packets. In this way, a level of traffic throughput is maintained. Within the stateful signature detection module, congestion algorithms are adapted for use in the detection of denial-ofservice attacks. During these attacks, large volumes of traffic are observed. As illustrated in figures 2 and 3, the control traffic fits the normal probabilitiy plot well, whilst the upsurge in traffic caused by a TCP SYN flood is apparent. Rather than purely dropping packets when the router threshold is met, packets that are to be dropped from the queue are inspected by the PF. This enables inference of stateful information about traffic flows and whether these unusual flows are attributable to a particular destination. It is the random inspection that allows the state inference. If two (or more) sampled dropped packets are heading to one destination, they are passed for stateless signature inspection as it indicates the possibility of a large flow of traffic in one direction. Fig. 2. 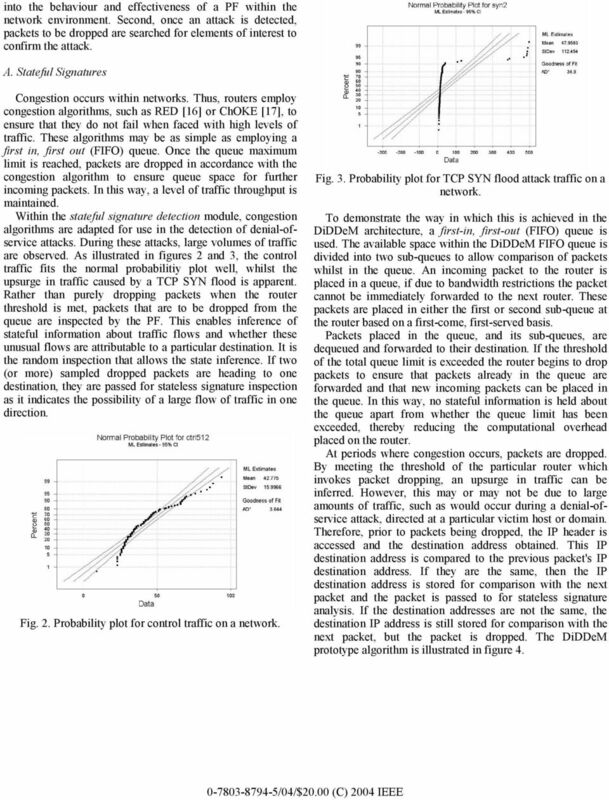 Probability plot for control traffic on a network. Fig. 3. Probability plot for TCP SYN flood attack traffic on a network. To demonstrate the way in which this is achieved in the DiDDeM architecture, a first-in, first-out (FIFO) queue is used. The available space within the DiDDeM FIFO queue is divided into two sub-queues to allow comparison of packets whilst in the queue. An incoming packet to the router is placed in a queue, if due to bandwidth restrictions the packet cannot be immediately forwarded to the next router. These packets are placed in either the first or second sub-queue at the router based on a first-come, first-served basis. Packets placed in the queue, and its sub-queues, are dequeued and forwarded to their destination. If the threshold of the total queue limit is exceeded the router begins to drop packets to ensure that packets already in the queue are forwarded and that new incoming packets can be placed in the queue. In this way, no stateful information is held about the queue apart from whether the queue limit has been exceeded, thereby reducing the computational overhead placed on the router. At periods where congestion occurs, packets are dropped. By meeting the threshold of the particular router which invokes packet dropping, an upsurge in traffic can be inferred. However, this may or may not be due to large amounts of traffic, such as would occur during a denial-ofservice attack, directed at a particular victim host or domain. Therefore, prior to packets being dropped, the IP header is accessed and the destination address obtained. This IP destination address is compared to the previous packet's IP destination address. If they are the same, then the IP destination address is stored for comparison with the next packet and the packet is passed to for stateless signature analysis. If the destination addresses are not the same, the destination IP address is still stored for comparison with the next packet, but the packet is dropped. The DiDDeM prototype algorithm is illustrated in figure 4. 6 to be SYN flood packets. The 50 attack and 8 benign packets were identified giving a 100 per cent detection rate. This approach is efficient to meet the demands of highvolume detection. In the example above, the signature search was completed in 0.65 seconds. This process includes the time to read the text into the program, the processing of the stream, and print the results on a Pentium II 400MHz test host. Of this time, the host took 0.64 seconds to read the text into the program, so that the signature match itself actually took 0.01 second. V. CONCLUSIONS AND FURTHER WORK Denial-of-service attacks remain a significant problem depsite the widespread deployment of perimeter security devices such as firewalls and IDS. This paper presents the DiDDeM system and the signatures required for early detection of TCP SYN flood denial-of-service attacks. This system utilises congestion algorithms already used by routers to filter the volume of traffic inspected and infer stateful information about direction of traffic flows. Stateless signatures are then applied. The results of experiments with DiDDeM against TCP SYN floods are presented and demonstrate the applicability of the system in high-speed, high-volume network environments. Future work concentrates on the application of the system to other denialof-service attacks and other attacks that require a high volume of traffic such as worms. REFERENCES  Richardson, R., 2003 CSI/FBI Computer Crime and Security Survey, Computer Security Institute/ Federal Bureau of Investigation Technical Report, 2004, available from  Moore, D., Voelker, G. M., & Savage, S. Inferring Internet Denial-of-Service Activity, Proceedings of 10th Usenix Security Symposium, 2001, Washington, DC. Mankins, D., Krishnan, R., Boyd, C., Zao, J., Frentz, M., Mitigating Distributed Denial of Service with Dynamic Resource Pricing,, Proceedings of the Annual Computer Security Applications Conference (ACSAC) 2001, New Orleans, Louisana, USA,  Meadows, C., A cost-based framework for analysis of denial of service in networks, Journal of Computer Security, 9, pp ,  Ioannidis, J., Bellovin, S. M., Implementing Pushback: Router-based Defense Against DdoS Attacks, Proceedings of the Network and Distributed Systems Security Symposium, San Diego, CA, USA,  Kuzmanovic, A., Knightly, E. W., Low-Rate TCP- Targeted Denial of Service Attacks, Proceedings of SIGCOMM 03, Karlesruhe, Germany,  Lemon, J., Resisting SYN floods DoS attacks with a SYN cache,. 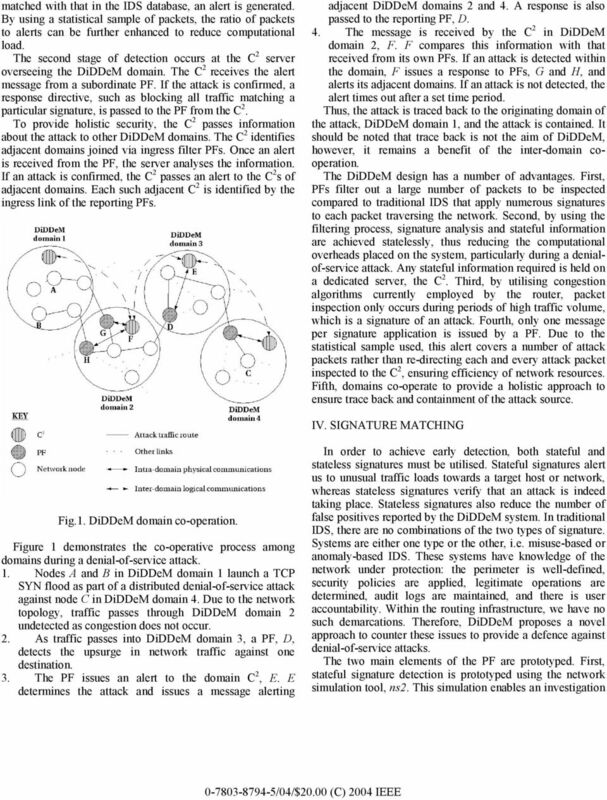 Proceedings of BSDCon 2002, Berkeley, CA, USA,  Schuba, C. L., Krsul, I. V., Kuhn, M. G., Spafford, E. H., Sundaram, A., Zamboni, D., Analysis of a Denial of Service Attack on TCP. 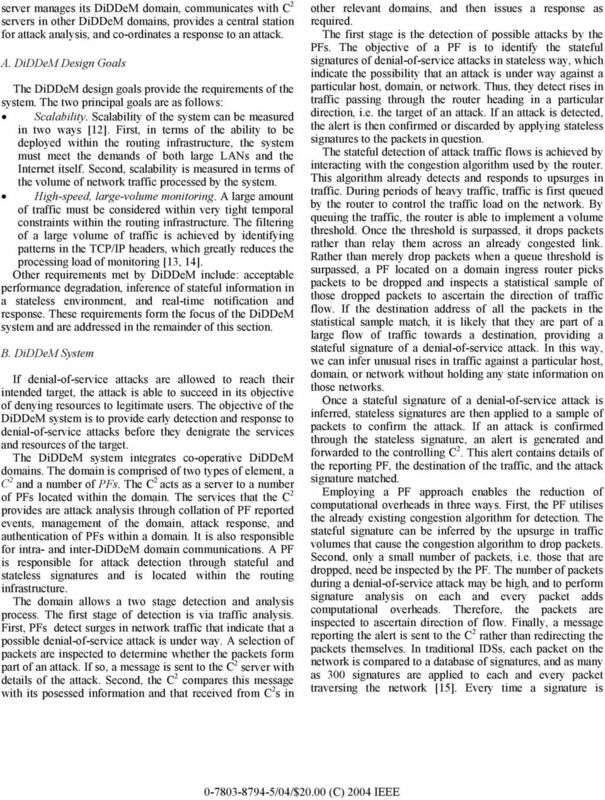 Proceedings of IEEE Symposium on Security and Privacy, Oakland, CA, USA,  Mutaf, P., Defending Against a Denial-of-Service Attack on TCP, Proceedings of RAID 99,  Huang, Y., Pullen, J. M., Countering Denial-of- Service Attacks Using Congestion Triggered Packet Sampling and Filtering, in Proceedings of the 10th International Conference on Computer Communication and Networks, Scottsdale, AZ, USA,  Mansfield, G., Ohta, K., Takei, Y., Kato, N., Nemoto, Y., Towards Trapping Wily Intruders in the Large, Computer Networks, 34(4), p ,  Krugel, C., Toth, T., Distributed Pattern Detection for Intrusion Detection, Proceedings of the Network and Distributed System Security Symposium, San Diego, CA, USA,  Zhang, Y., Paxson, V., Detecting Backdoors Proceedings of the 9 th USENIX Security Symposium, Denver, Colorado, USA,  Hussain, A., Heidemann, J., Papadopoulos, C., A Framework for Classifying Denial of Service Attacks, Proceedings of SIGCOMM 03, Karlesruhe, Germany,  Coit, C.J., Staniford, S., McAleney, J., Towards Faster String Matching for Intrusion Detection or Exceeding the Speed of Snort, Proceedings of DARPA Information Survivability Conference and Exposition (DISCEX 01), Anaheim, CA, USA,  Floyd, S., Jacobson, V., Random Early Detection Gateways for Congestion Avoidance, IEEE/ACM Transactions on Networking, 3(4), pp ,  Pan, R., Prabhakar, B., Psounis, K., CHOKe: A Stateless Active Queue Management Scheme for Approximating Fair Bandwidth Allocation, Proceedings of IEEE Infocomm, Tel Aviv, Israel, 2000. Detection and Prevention of Denial of Service Attacks Using Distributed Denial-of-Service Detection Mechanism A.Prathap, R.Sailaja. Department of CSE, Sri Sai Aditya Institute Of Science And Technology.